Travel Native America! And all the US and Canada IS Native America! Around the corner, next city over, that province to the East, that island to the south, that desert to the west and from sea to shining sea, Canada and the United States are brimming with adventures hosted by Native peoples. Experience and explore Native American history, culture, sites, and activities with Native American Landmarks and Festivals: A Traveler's Guide to Indigenous United States and Canada. From ancient rock drawings, historic sites, and modern museums to eco- and cultural tourism, sports events, and powwows, Native Landmarks and Festivals provides a fascinating tour of the rich heritage of Indigenous people. This is not a book for the "drive by" tourist, who wants to gawk at Native life. 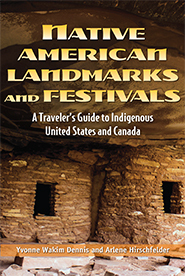 In this pages, visitors can choose from a vast array of adventures associated with Indigenous cultures: dog sledding; tipi camping; hunting and fishing expeditions; museum exploration, ancient buildings and rock art; researching Indigenous history with the people descended from that history; creating art; herbal walks; building and sailing in canoes; hiking along ancient routes; festivals; powwows; and preparing and eating Native foods. And non-Native travelers may be surprised to learn they can experience activities at Native-owned vineyards, hotels, water-parks, sports complexes, rodeos, campsites, casinos and resorts that feature fine dining, and an incredible variety of entertainment. Indigenous points of view are voiced in state and federal parks, federal and international heritage sites, public and private museums and non-Native events that include Indigenous collaboration. There are listings of an array of contemporary events like film festivals, book fests and award ceremonies. There are 1,200 separate and unique Native cultures in the two biggest nations in North America, far more than Papua New Guinea, which is mistakenly labeled "the most diverse country in the world." Whether a rough ride to the ancient Kaunolu Village Site on Lanai, Hawaii, the Sand Creek Massacre National Historic Site or the Poarch Band of Creek Indians of Alabama's powwow on Thanksgiving Day, there is much to experience in the Indigenous world right around the corner, including • The Montezuma Castle National Monument • The annual All Indian Rodeo in Las Vegas, Nevada • Sequoyah's Birthplace • Trail of Tears National Historic Trail • Jim Thorpe House • The Autry Museum of the American West • The Mashantucket Pequot Museum & Research Center • The Thunderbird Powwow in New York City • Aztec Ruins National Monument • The First Nations Film and Video Festival in various cities and states • Crazy Horse Memorial • The Harvest Moon American Indian Festival • The Little Bighorn Battlefield National Monument • Dog-sledding tour through a boreal forest • Wounded Knee Battlefield • Grand Portage National Monument • And hundreds more! Featuring vivid illustrations, and a useful index to aid discovery, this informative guide provides the exact location, phone number, and website for each of the 729 landmarks, sites, festivals and activities. Whether preparing for a road-trip or an armchair adventure, Native American Landmarks and Festivals: A Traveler's Guide to Indigenous United States and Canada will bring hours of enjoyable reading and discovery. Library Journal gave Native American Landmarks and Festivals a stellar review. We hope you agree and take time to post your travels on our Facebook page. The most complete and affordable single-volume reference work about Native American culture available today, the Native American Almanac is a unique and valuable resource devoted to illustrating, demystifying, and celebrating the moving, sometimes difficult, and often lost history of the indigenous people of America. Capturing the stories and voices of the American Indian of yesterday and today, it provides a range of information on Native American history, society, and culture. Perfect for middle school and young adult readers. Winner of:2014 Arab American Book Award, Children/Young Adult Category Many Americans, educators included, mistakenly believe all Arabs share the same culture, language, and religion, and have only recently begun immigrating to the United States. A Kid's Guide to Arab American History dispels these and other stereotypes and provides a contemporary as well as historical look at the people and experiences that have shaped Arab American culture. Each chapter focuses on a different group of Arab Americans including those of Lebanese, Syrian, Palestinian, Jordanian, Egyptian, Iraqi, and Yemeni descent and features more than 50 fun activities that highlight their distinct arts, games, clothing, and food. Kids will love dancing the dabke, constructing a derbekke drum, playing a game of senet, making hummus, creating an arabesque design, and crafting an Egyptian-style cuff bracelet. Along the way they will learn to count in Kurdish, pick up a few Syrian words for family members, learn a Yemeni saying, and speak a little Iraqi. Short biographies of notable Arab Americans, including actor and philanthropist Danny Thomas, singer Paula Abdul, artist Helen Zughaib, and activist Ralph Nader, demonstrate a wide variety of careers and contributions. This award-winning hands-on interactive book is chocked full of activities, games, and crafts introduce children to the diversity of Native American cultures and teach them about the people, experiences, and events that have helped shape America, past and present. Nine geographical areas cover a variety of communities like the Mohawk in the Northeast, Ojibway in the Midwest, Shoshone in the Great Basin, Apache in the Southwest, Yupik in Alaska, and Native Hawaiians, among others. Lives of historical and contemporary notable individuals like Chief Joseph and Maria Tallchief are featured, and the book is packed with a variety of topics like first encounters with Europeans, Indian removal, Mohawk sky walkers, and Navajo code talkers. Readers travel Native America through activities that highlight the arts, games, food, clothing, and unique celebrations, language, and life ways of various nations. Kids can make Haudensaunee corn husk dolls, play Washoe stone jacks, design Inupiat sun goggles, or create a Hawaiian Ma’o-hauhele bag. A time line, glossary, and recommendations for Web sites, books, movies, and museums round out this multicultural guide. There is no typical American child. Children may share similar activities and pastimes, but they represent a variety of ethnic, cultural, and religious backgrounds. Striking photographs showcase fifty-one cities - one from each state, as well as our nation's capital, Washington, D.C. The photos and facts feature common activities and interests, as well as varied foods, languages, entertainment, sports, and other examples of daily life throughout the country. Published in conjunction with The Global Fund for Children. Children of Native America Today includes some of the 500 Native groups from reservations to large cities. Bright color photographs highlight the richness and diversity of Native lands, cultures, and daily life. Winner of the Notable Books for a Global Society Award and selected for the CCBC Choices 2004 list. Students are introduced to Native Americans with a realistic understanding of Native culture and history. Through reproducible activities, biographies of real people, and accurate background information, this book shows students how Native Americans live today. Chocked full of essays, articles, recommended (and not recommended) materials, this book is vital for anyone concerned with accuracy and fairness about American Indian peoples.